You should deploy identical VARP configuration (VARP IP and MAC address) on all ToR (leaf) and core (spine) switches. This design not only ensures optimal L3 forwarding between any two ToR endpoints, but also optimal inbound (external client to server) traffic forwarding. 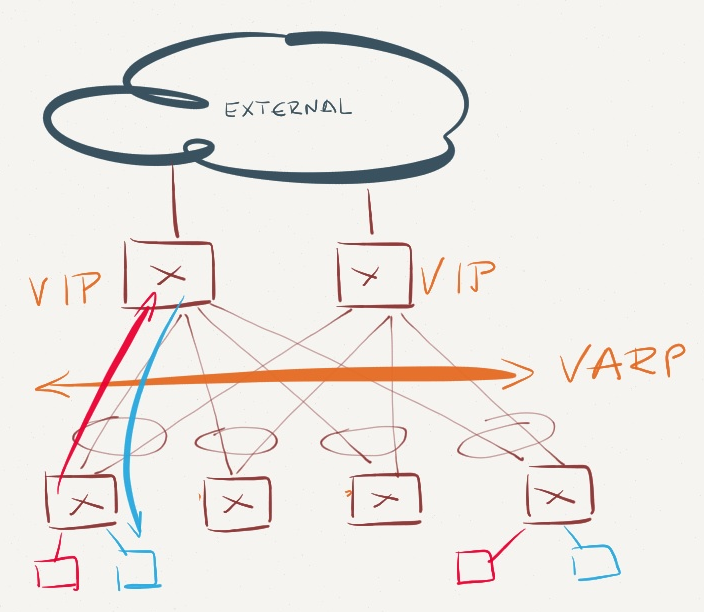 All other designs (or configuration mismatches) result in suboptimal forwarding, but don’t cause packet forwarding loops or duplicate/dropped packets due to another VARP feature: periodic gratuitous ARP packets sent from all VARP-enabled switches. 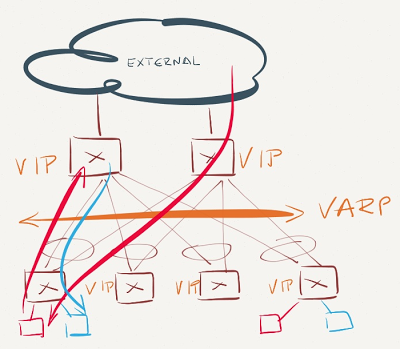 VARP is enabled immediately after you configure virtual router IP and MAC address on an Arista EOS switch – it requires no protocol between VARP-enabled nodes and has no concept of primary/backup forwarders. The moment you configure VARP, the switch starts replying to ARP requests for the virtual router IP address with the virtual router MAC address (the ARP reply is sent from the physical MAC address of the switches). Every host gets numerous ARP replies for every ARP query – one from each VARP-enabled switch. End hosts use VARP virtual MAC address to send packets to the first-hop router. The first VARP-enabled L3 switch in the forwarding path grabs the packet (based on the "router MAC address" entries in its TCAM) and performs L3 lookup. An IP packet forwarded by a VARP-enabled L3 switch is sent from the physical MAC address of the L3 switch, not from the VARP virtual MAC address. 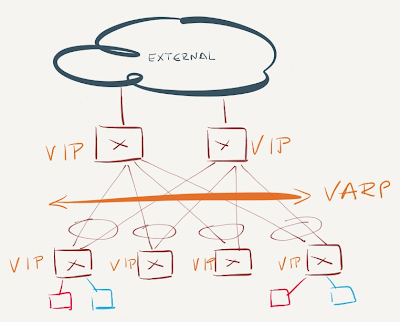 The virtual MAC address is "silent" (no traffic is sent from that MAC address), which caused my initial concern – unicast packets sent to the virtual MAC address might get flooded by L2 switches in the path, resulting in multiple copies of the same packet being forwarded to another VLAN. Arista solved the unicast flooding problem with periodic gratuitous ARP replies sourced from the shared VARP MAC address. Every VARP-enabled switch sends the GARP broadcasts and you can configure the advertisement interval (it should be several times smaller than MAC aging timer); the default value is 30 seconds. A VARP-enabled Arista switch receiving gratuitous ARP reply will ignore it (after all, it knows what's going on) and will not try to protect its own IP address (if you don't know what I'm talking about, try configuring the same IP address on two or more switches). Likewise, a L2 EOS switch ignores the fact that broadcasts from the same MAC address come from numerous ports (this behavior might trigger "flapping MAC addresses" warnings on other switches). End result: every switch in the network either receives traffic sent to the VARP MAC address (if it has VARP configured) or forwards the traffic toward the last switch that sent gratuitous ARP broadcast from the VARP MAC address. All servers in VARP-enabled VLAN receive (and have to process) the gratuitous ARP replies sent by VARP-enabled switches. Don't set the ip virtual-router mac-address advertisement-interval to a small number unless you love wasting CPU cycles across the whole data center. Also, keep in mind that layer-2 domains don’t scale. Now let's see how a L2+L3 leaf-and-spine fabric (with two core switches in a MLAG group) reacts to VARP configuration errors by walking through several bad designs and VARP configuration errors, starting with the easiest one. These scenarios assume that the core switches in the leaf-and-spine fabric connect the fabric with the outside world. The core switches reply to ARP requests for VARP virtual IP address and receive traffic for VARP virtual MAC address. Inter-subnet traffic flows through the core switches. Not optimal, but not too bad either (depending on the amount of inter-subnet east-west traffic). If the core switches don't have an IP address in the VARP-enabled VLAN, they have to learn about the VARP-enabled IP subnet from the ToR (leaf) switches through a routing protocol. With all ToR switches advertising the VARP-enabled IP subnet, the core switches have N equal-cost paths toward that subnet (with N being equal to the number of the ToR switches), and the probability that a core switch forwards the packet to a wrong ToR switch equals (N-1)/N. All misdirected packets have to be L3-forwarded by the target ToR switch and sent back to the final ToR switch through the leaf-to-spine uplink. 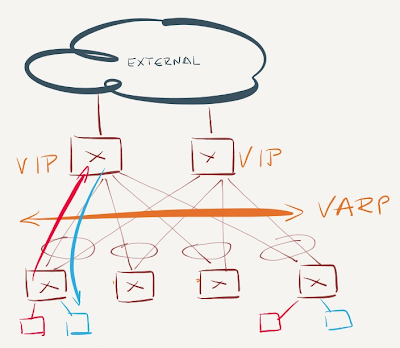 Summary: Make sure VARP is always configured on spine switches. 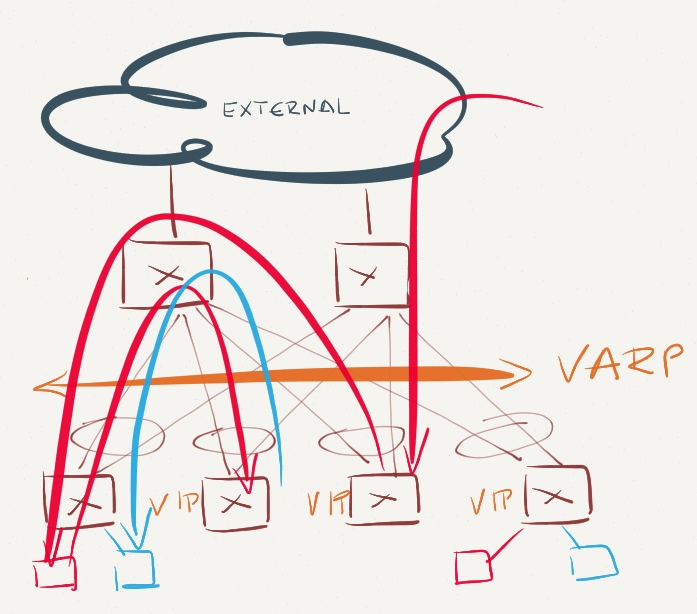 Traffic entering the network from servers connected to non-VARP-enabled ToR switches will be sent toward the closes VARP virtual MAC address – the spine switch. The spine switch will perform L3 forwarding, potentially sending the packet back to the same leaf switch. While some of the east-west traffic might take suboptimal paths, the traffic to and from the outside world will always flow optimally. This is the worst possible scenario. Traffic sent from the servers in VARP-enabled subnet might have to traverse the network core to be forwarded on another ToR switch. Even worse, all inter-subnet traffic entering non-VARP ToR switches will be sent to the same VARP-enabled ToR switch - the one that last sent gratuitous ARP broadcast. Assuming the core switches don't participate in L3 forwarding for the VARP-enabled subnet, they'll send the traffic to one of the VARP-enabled ToR switches (see VARP is enabled just on the leaf switches scenario), yet again resulting in suboptimal traffic flow. 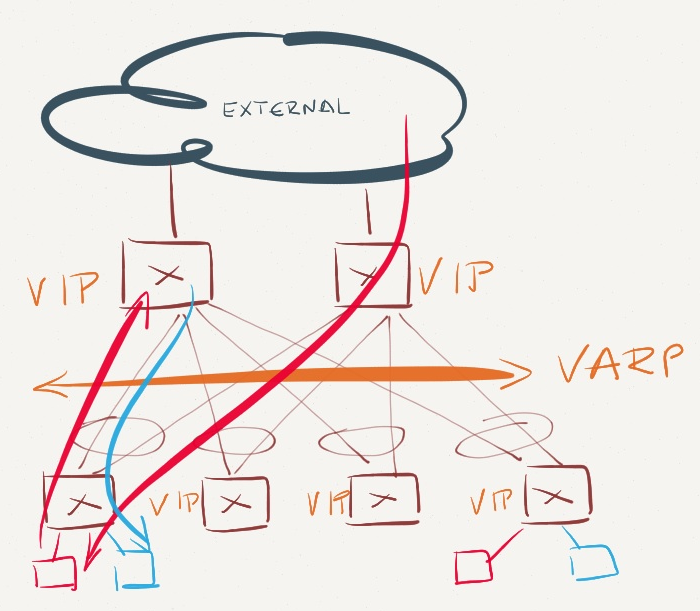 VARP is a simple and extremely effective mechanism to achieve optimal L3 forwarding across a data center fabric, assuming you consistently deploy it on all switches in the fabric. 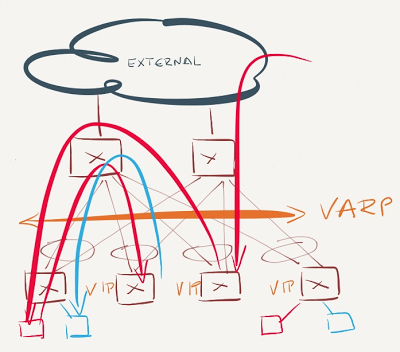 At the very minimum, you should deploy VARP on ToR switches participating in the VARP-enabled VLAN and on all core switches. 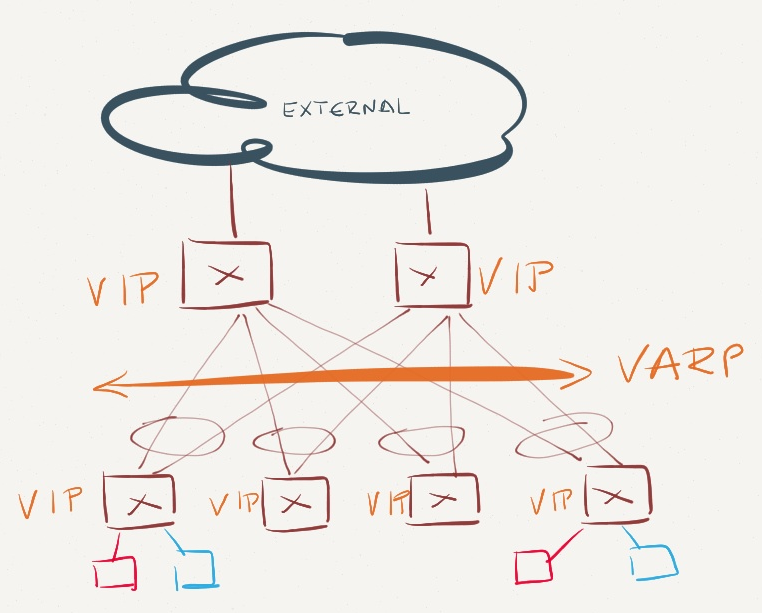 VARP does rely on somewhat non-standard behavior (same MAC address being advertised by numerous switches), so make sure you test it first before a deployment in a mixed-vendor environment. only issue I see (if you can even call it that) would be the address space pollution needed by all the ToR switches. Careful planning would be needed to ensure that the first/last 10-20 addresses of any subnet are reserved for the 'real' ip addresses used by the ToR switches. and not have to individually address each ToR switch. Obviously the switch would lose the ability to source packets from that interface, but I'm not sure what else would break. Good one. Totally missed this aspect. Thank you! I love the idea of distributed L3 switching and the complete convergence of L2 and L3 domains. 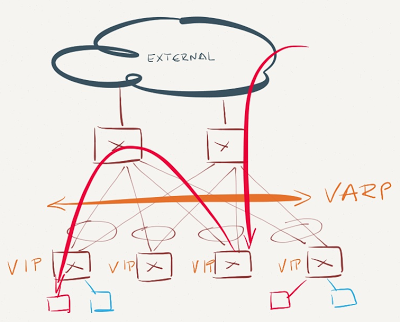 Short of the single caveat that Justin points out, VARP seems to deliver functionality very similar to QFabric. In addition to the address space required of the real addresses, it just seems to increase the complexity of the implementation. If only ICMP could be sourced from the VARP address, then perhaps the real addresses would be unnecessary. 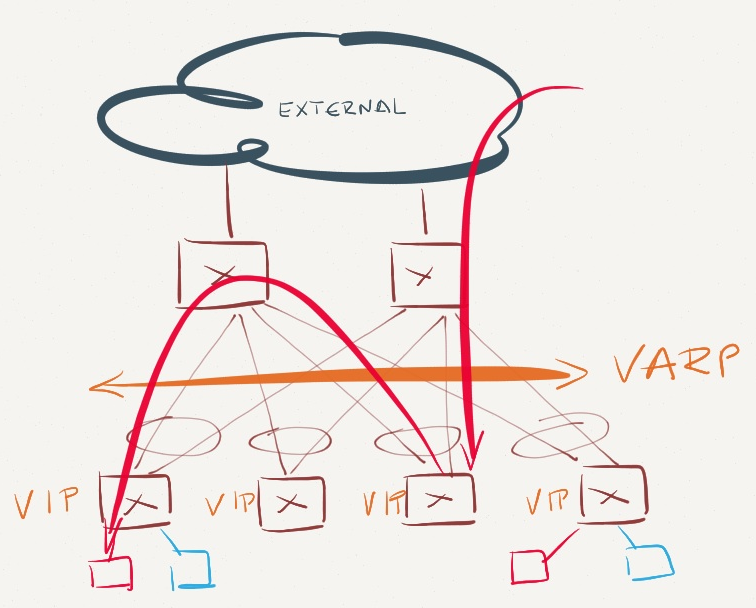 I agree with Anonymous, I have the issue where VIP gateways don't respond but pass traffic, and with OSPF plus MLAG see issues where routing + varp don't work correctly. Let's assume that the virtual router has two switches SW1 and SW2 with VARP configured. SW3 is connected to both SW1 and SW2 and currently learned the virtual MAC on SW1's port. Now, if the link between SW1 and SW3 is down, SW3 won't know where the virtual MAC is. It will flood the packets to all links until the next GARP request. SW2 has no way to know that a link on SW1 failed and therefore cannot trigger a GARP request. Right? Unless VARP only works in the context of MC-LAG. In this case, when SW1 detects the downlink, it generates GARP requests that will be flooded to SW2 then back to SW3 which will now use SW2's port for the virtual MAC. That is correct, SW2 will never know that the link on SW1 has failed. But if you don't want flooding to happen, worst case for 30 sec (default GARP time), you can tighten the GARP timer setting, say to 10 sec. But that has the tradeoff of wasting CPU cycles of 3X of that default GARP timer for the nodes that are processing the GARP frames.